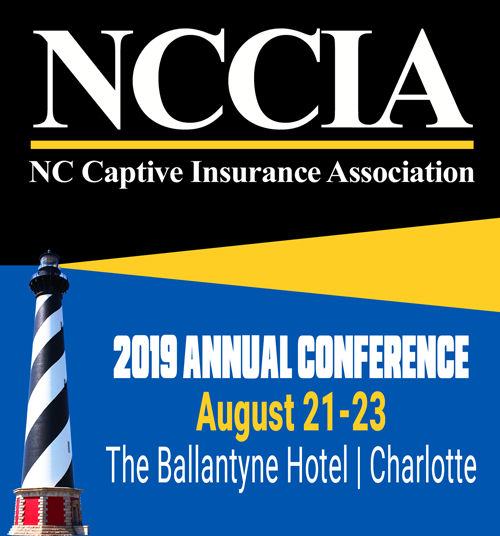 (SOUTHERN PINES)….Welcome to the new look of the NC Captive Insurance Association Newsletter, now called North Carolina Captive. Over the course of the year we will be making changes to the newsletter to try to bring you more pertinent industry information and news about what is happening with our members. To make the latter happen we need your help. If you have news of your company such as new products, employee promotions or other news please send it to us at the address below. We will do our best to publicize it in an upcoming addition, subject to editing to meet space requirements. The venue for the 2018 Annual Conference has been changed due to renovations that will be underway at the Ballantyne Hotel August 20-22. This years conference will occur at the LeMeridian Hotel in Uptown Charlotte. According to Thomas Adams, NCCIA President & CEO, “We were surprised by Ballantyne’s decision to move to renovate it’s public spaces during our contracted dates. That decision necessitated the move to the LeMeridian. The move will allow us to do some new things during this years conference plus give our attendees the chance to visit the many attractions in Uptown, all within a couple blocks of the hotel.” Registration will open in early April. As North Carolina’s captive industry enters it’s fifth year substantial changeshave occurred in the number and type of captives domiciled here which has also impacted on the association. The original Board of Directors was established with each director being permitted to serve two, two year terms as a director. The board believes that after experience with this model a better way would be for board members to serve one, three year term. According to NCCIA Chairman Jeremy Colombik the change would “promote healthy board turn over, ensure proper diversity on it’s membership and create a standardized process for board elections.” The Board has approved the change and a new process that will be incorporated into the Bylaws document. When publication time approached the NC Department of Insurance was still working to finish processing a large number of applications for new captives who desire to domicile in North Carolina. According to Debbie Walker, Deputy Commissioner for captives, “the state expects to be able to announce final year end numbers in the near future”. Based on what NCCIA is hearing from it’s members we expect 2017 to have been another robust year for captives in the state. As we kick off 2018 please do not hesitate to contact us about ways we can improve your membership experience. We love to hear from our members and promise to be responsive to your needs. Have a great 2018.